Girls in Year 8 visited Downsend School to take part in The Rotary Club of Dorking’s Youth Speaks Competition. 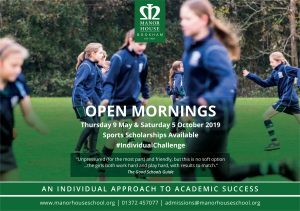 Our pupils did amazingly well against tough competition and represented Manor House with confidence and maturity. The girls in Year 8 who took part were Alicia P, Chloe M, Sofia M-T, Savannah P, Olivia C and Verity A. We entered two teams of three and both did extremely well against tough competition. Alicia, Chloe and Sofia worked collaboratively in preparing their presentation on Sofia’s topic of Terrorism and Islamophobia: a challenging subject which she delivered confidently. Alicia and Chloe received a special mention from the Judges for their friendly and charismatic delivery as Chairperson and Proposer of the Vote of Thanks. The second team to present was Savannah, Verity and Olivia. Verity’s speech was engaging on the topic of Sugar and we were all left questioning our guilty pleasures! All three girls spoke eloquently and with genuine warmth. We were extremely proud of the girls’ deliveries and they all received some enthusiastic comments from parents, teachers and members of the Rotary Club. Many commented that they could not have stood up and delivered such powerful speeches at such a young age! Well done girls and thank you for representing our school so brilliantly. You should feel very proud of yourselves.